Guests were treated to local wines and beers, as well as catered food from Bravo’s and El Molcajete - both Boone County establishments. Dessert was provided by Erica Koren Cakery, in Belvidere, which included handmade cookies and gourmet cupcakes. The focus on local didn’t stop there. Blackhawk Bank gave away a basket full of only local items from wines to jams to Prairie Pure Cheese. Kathie Wesemann, was excited to be announced the basket winner. The highlight of the evening was the 50/50 raffle benefiting Boone County CASA. Charlotte Meier, the organization’s Executive Director, was on hand to pull the winning ticket. Kim Cooley was the lucky winner of $108, which she donated back to CASA. Altogether, the event raised $216 for Boone County CASA. The event provided a great evening for networking, enjoying the flavors of Boone County and supporting local businesses and organizations. Established in 1881, Blackhawk Bank has served individuals, families and business owners for 137 years. The Bank operates eight full service banking centers in Rockford, Belvidere, Machesney Park and Roscoe, Illinois and in Beloit and Janesville, Wisconsin. The Bank also operates a Business Banking Center in Elgin, Illinois and a Mortgage Processing Center in Roscoe, Illinois. 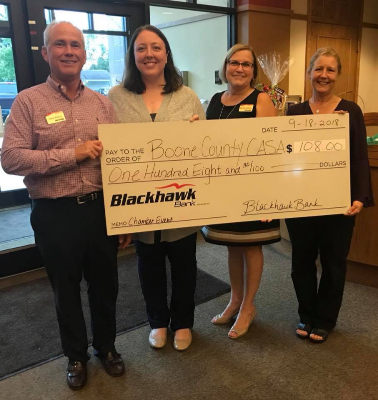 Complete information about Blackhawk Bank can be found at www.blackhawkbank.com.